Now, we’ve got the bottles for you! 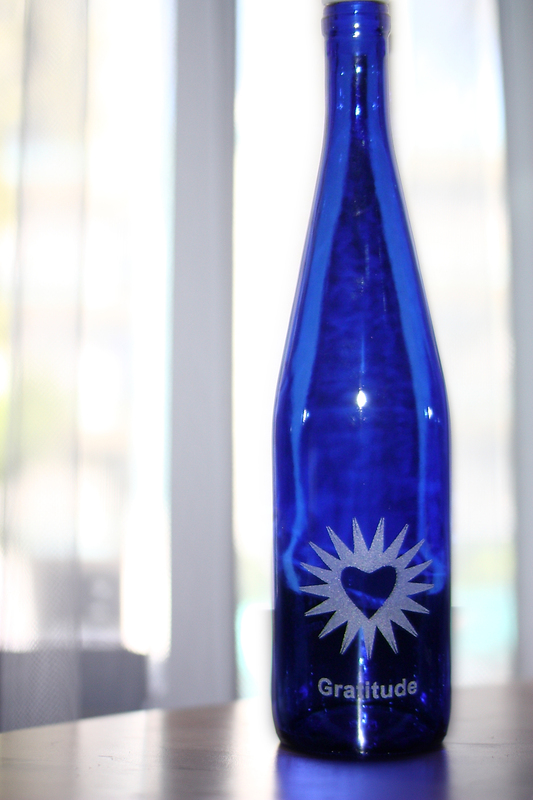 Each bottle is beautifully etched with your choice of an intention. Choose from Gratitude (shown), Prosperity, Joy, Love. Changes the molecular structure of the water. Raises the water’s vibrational frequency. This raises your vibrational frequency, too! Sunlight through blue glass releases the chemical content of the water. This makes it healthier for you. Cobalt Blue is the color of the 17th Ray (the will of God). It’s like drinking the will of Source Energy. Each bottle comes with a Rabbit Stopper! Choose Intentions from: Prosperity, Joy, Love, Gratitude.